Wicca is a religion that many people have heard of, yet so few outside it understand. Most people hear the term and a green figure with a pointy hat comes to mind, flying across the moon on a broomstick. However, you will find no Wiccan turning people into frogs and casting curses on their ex-boyfriends. Wiccans use the resources of the Earth and the power of their intentions that reside within them to work magic in the world and live their daily lives as anyone else. In its purest sense, Wicca is simply a celebration of nature, of attuning one’s self to the cycles of the moon and the changing of the seasons. During the fall season, we acknowledge the darker days of the year and honor our departed loved ones during Samhain (pronounced Sow-en), also known as Halloween. Unlike today’s traditions which involve dressing in elaborate costumes and going door to door for treats, the sabbath of Samhain is celebrated by honoring deceased loved ones. The veil between our world and the spirit realm is at its thinnest, and it is the perfect time for forms of divination such as tarot cards and crystal scrying, as well as connecting with spirits from your ancestral line. To me, the most essential part of Samhain is honoring your ancestors. The veil between the living and the dead is the thinnest on Samhain, so the night is spent honoring those who have passed before you, and inviting them back to the world of the living in order to celebrate the balance between life and death. 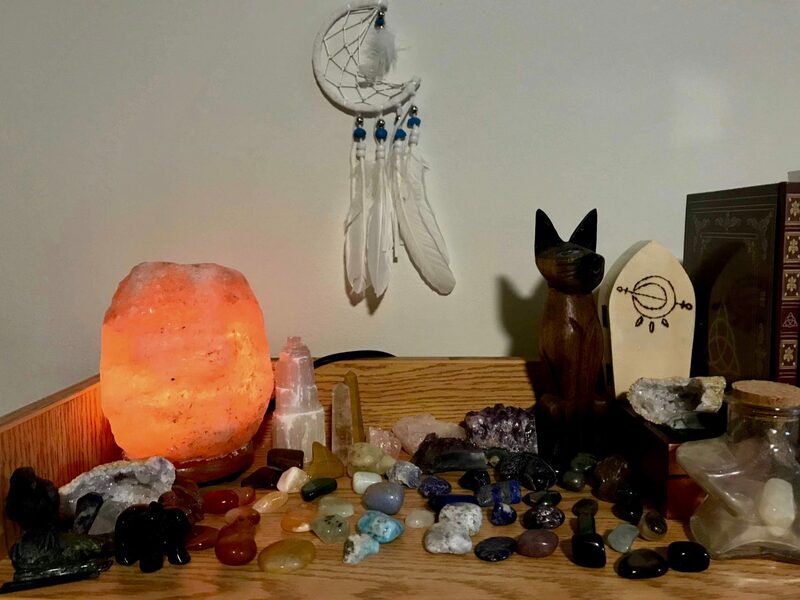 The biggest part of this is building your ancestral altar: photos of passed loved ones, items they owned, family heirlooms, even a family tree, as well as things like candles, bones, crystals and other tools you’d put on your year-round altar. Another major component is the “dumb” dinner. Sometimes done in complete silence, an extra place is set at the dinner table. The plate is filled with a portion of dinner and the glass is filled (typically with some kind of alcohol) to welcome your family back with you for the evening.